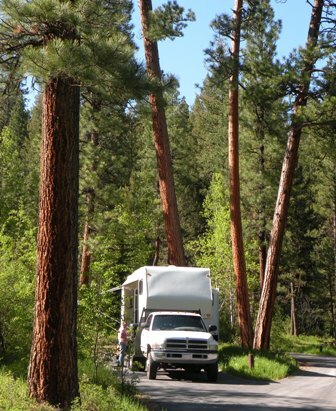 Type of Camp: Developed Campground Fee: $10 Golden access and other interagency passes are accepted. Cell Signal: sufficient signal without amplfication for air card to function on verizon in the Higher sites.Voice signal would not carry a call without amplifier. Several old logging roads take off from the vicinity of the campground either for four wheel drive, ATV or hiking. There are Bears and Wolves in the area. A clean camp and keeping close tabs on yourdogs and/or cats is a necessity.